For those of you who aren't in the know, this is Rob Raco. He plays Joaquin DeSantos, aka Kevin Keller's boyfriend, on CW's Riverdale. Unfortunately, Joaquin doesn't have the most lines (or the most screen time). There's even a chance he might not be back for season 2. 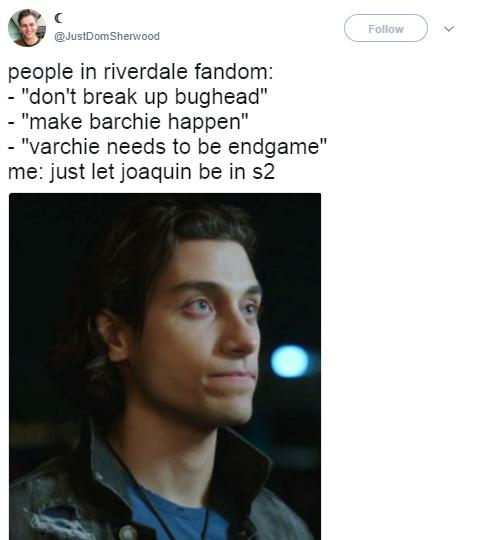 But, in honor of the most underrated member of the Riverdale cast, I would like to hand down an official and legally binding Popbuzz ruling on Rob Raco. Ladies and gentleman of the jury, I hereby submit into evidence definitive proof that Rob Raco is the real Daddy™ of the Riverdale cast. Yes, I know. This is a huge and potentially life changing claim. Many believed that Riverdale's Daddy™ had to be a member of the core four. But...I am here to debunk that misconception. And there is certainly no denying that his hair does the thing. And, have you ever heard of art? Some would even say that this scene was the pinnacle of Riverdale season 1. We're hoping that Joaquin returns from San Junipero but, if he doesn't, we'll remember him fondly. Yes, we're officially Rob Raco stans now. Please respect our privacy at this time while we wait to find out if he's back for season 2.